Nylon bristles, fan shaped at one end on a twisted galvanized iron wire. 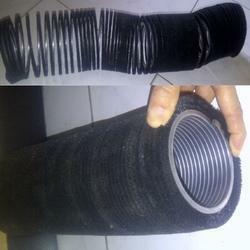 Product Description: Our company has gained name and fame in presenting Twisted Brush. Glass Agencies EROSE are Manufacturer of Test Tube Brush. Nylon bristles on iron wire. Head size 90 x 45 mm. Overall length 260mm. Brush flask nylon head held in iron wire on rubber-covered stem with wooden handle. Dimensions: length x dia : 100 x 50mm. We are the foremost manufacturers of double spiral brushes, single spiral wire brushes which are widely popular for light scale removal. 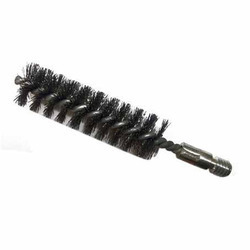 These spiral brushes are also used in general brushing procedure, which is used in all types of straight tubes. Double spiral brushes are available in a range of sizes from 8 mm to 350 mm and can be customized as per the client’s requirement. The range is also offered in varied fill material options like carbon steel or stainless steel in a size range of .003" to .010" and 120 grit abrasive nylon, ranging between diameters of .028" and .040".